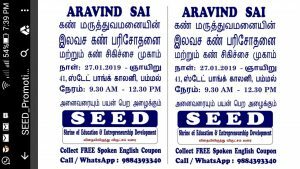 There are 2 Eye Screening Camps by ARAVIND SAI EYE HOSPITAL, one in Pammal SBI Colony organised by SEED (a special camp), and another one in VIVEKANANDA School, Chrompet (a usual monthly 4th sunday camp). Public are requested to get benefited by the camp. A team of Optometrist and Staff will examinE public completely in free of cost. Spectacles will be given at concessional rate & also take the deserving selected patient for free cost of cataract surgery to Aravind Sai Eye Hospital including a day stay, food, Medicines & dark glasses. All are completely free under aegis of Kancheepuram District Blindness Control Society & Jansar Vision Charitable Trust. TIMING : 9.30am – 12.30pm. Aravind Sai Eye Hospital © 2017. All Rights Reserved.